This is a fun one, something that is a good thing to create once you are really good at visualization. 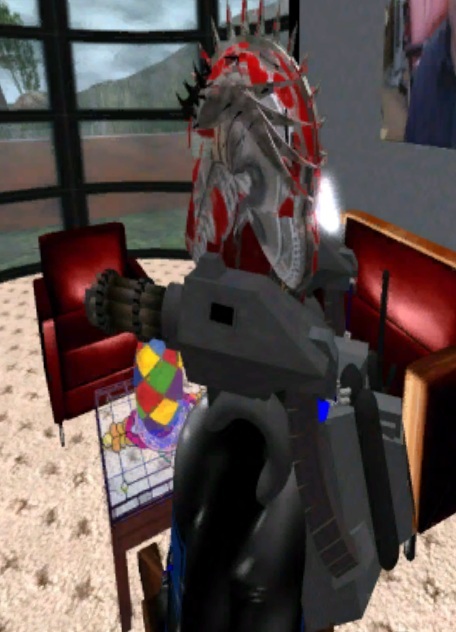 What you see here is a picture of my avatar on Second Life wearing a spine gun. It has two rotary guns, one resting on each shoulder and a backpack with the ammo and the battery that fires them. Ok, got that. Now, here is what you do. You visualize that gun on your shoulders. Practice this visualization every day until you can actually feel the weight of it on your body. Once you have that, it is time for the second step. Imagine it firing. No, you don't have to hear the noise. But when you imagine it firing, see the tracer rounds going from your shoulders to your target. Sounds simple, right? Well it takes some work to get it to the point where it is reliable, but once you do, it is a pretty effective little psionic toy because it becomes a thoughtform. What do you do with it? You use it to get annoying people to move out of your way. They won't know why they want to get out of your way, but they will. And of course you can program the bullets to do all sorts of things, but I don't have to go into detail here. You can figure that out for yourself.